You can’t always pay your tax bill on time. Sometimes, you end up owing more than you expected, and you’re blindsided by the bill come April. Other times, you know what’s coming, but you just don’t have it in the budget to have more taxes taken out of your check or to make more in advanced payments. In some situations, you may not even realize you owe. You might have filed your return and the IRS found a mistake, but the notice never got to you because you moved or because there was a problem with the mail. You would expect that the IRS would notify you directly if you had an outstanding tax bill. But now, the state of Arizona is following in the IRS’ footsteps in contracting with private debt-collection companies to get taxpayers to pay up. The Internal Revenue Service announced in April that it would start using private debt-collection agencies to go after delinquent debtors. The cost of hiring the private companies is less than trying to go after these debtors itself, the agency said. Now, Arizona is following suit, as well as several other states. California, North Carolina, Florida, Oklahoma, and Indiana all contract with private agencies for tax debt collection. Arizona has contracted with Account Control technologies and seven other agencies to go after delinquent taxpayers. The state ran a more limited version of the program with only three agencies before it launched the full-scale program. State officials have implemented a stringent program for vetting debt collection agencies to work on behalf of the state. Only companies that meet these high standards are allowed to engage in the state work. Some taxpayers may have already been contacted by one of these debt-collection agencies. The Arizona Department of Revenue says that the agencies will be up to contacting thousands of people with outstanding taxes every week by the end of the summer. Right now, the debt-collection agencies will be focused on contacting anyone who has a debt that is more than 40 days old. But the call shouldn’t come as a surprise. Anyone who owes money will have been notified by the state several times before the debt is turned over to an outside company. Any company that contacts a delinquent contractor by phone or by mail should identify itself as a contractor for the Arizona Department of Revenue. The company and its representatives must also follow the Fair Debt Collection Practices Act. Anyone who owes money may pay it to the company that contacts them or directly to the state. If you owe money to the IRS, it’s better to be proactive than to wait until you’re getting a call from a collector. You can always talk to a representative to get on a payment plan that you can afford, rather than ignoring the debt and letting it go to collections. The longer the tax goes unpaid, the more interest and penalties you will accrue. You should also talk to a tax attorney in Phoenix to review your return and determine if there are other ways for you to reduce your tax obligation. A tax attorney has extensive knowledge of the tax code and how you can minimize your tax liability. There may be additional credits you qualify for or deductions you can take. If you already have an overdue debt, a Phoenix tax debt lawyer may be able to help you reduce what you owe, as well. The tax debt lawyer may be able to negotiate a settlement for you or may be able to audit your past returns to find additional savings. If you owe taxes because of something your spouse did, your tax attorney can let you know if you qualify for innocent spouse relief and can help you apply for it. Silver Law PLC is a respected tax law firm in Arizona that may be able to help you. Our tax law firm handles tax collections, as well as audits, foreign tax reporting, innocent spouse relief, and more. We also represent clients in criminal and civil tax proceedings. Our attorneys have all worked as prosecutors for the IRS, so they have a unique perspective on how to defend your case. 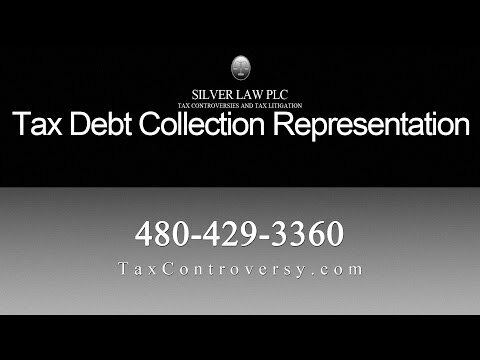 Contact us in Arizona today to talk with a tax debt lawyer about your legal options.